It was the second acceleration run that morning. At first, I jiggled the VBox for showing me a number that looked... er, slow. How could it be just 6.2 seconds to 100 kph, I wondered? I knew I was doing something wrong, but it wasn’t intentional. The sport function on our all-new BMW Z4 SDrive 35i test car had inadvertently malfunctioned (thanks to some geniuses at ARAI), and that meant there was no way I could drop it into Sport+, stand on the throttle pedal and brake at the same time, drop the gear into Drive Sport, raise the revs to 4000 and watch the Launch Control flag come on. All I could do now was raise the revs to 1500 rpm, call in the services of Drive Sport and then cross my toes. But hey, there was a way of getting around all this. And it meant just toggling in a function called ‘one-foot rollout’ on the VBox and doing it all over again – a tame concession then (Cheater! – Ed ). That’s exactly how we got our fastest acceleration time so far during a road test. With a slight wiggle of the rump, the Z4 spooled one turbo, then another and then the VBox flashed – 0-100 kph in 5.48 seconds! From there on, every other number that our speed testing device spewed out kept dropping my jaw further, and further. There were no concessions here, no shortcuts nor pitfalls. BMW India has gone the whole hog and given us their most powerful inline six and a multiple time Engine of the Year winner at that! 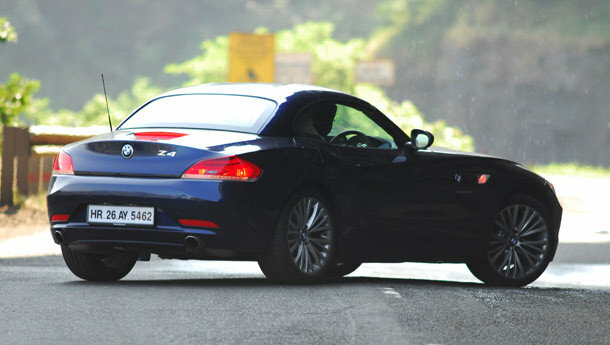 It’s also, by far, the most expensive Z4 made by BMW, at Rs 75.92 lakh on-road, Mumbai, even before you tick the options list! But is it the best? Does it have just a trophy engine and stupendous performance figures alone, or has it really gone one up on its predecessor and in the process its rivals? 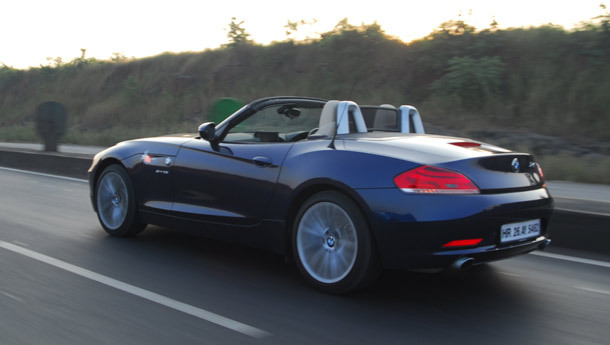 At first, it appears that BMW may have committed a mistake in hurrying up a new Z4. The outgoing Z4 never really aged, even as the new car swept in, which proves that flame surfacing has proved itself as a fantastic base and that the new Z4 only carries the tradition forward, but in a more evolved manner. But would it be sexist to say that by shifting the design language from a man to a woman, the car has lost its essence? That would be completely untrue. What Danish designer Andreas Warming did with the original Z4 was lend it convex lines, while maintaining two beltlines that define the characteristic roadster shape. The same has been done, albeit differently, by the first woman to design a BMW. Julia Blasi, who designed the exterior, brought back more aggression and defined the car with fewer hidden lines. She says she was inspired by design elements from the famous 507 roadster and the Z8. The Z4 still retains the prominent long bonnet, short deck look, but has resorted to making that visual element stronger by ensuring the folding hard top keeps the tradition of the Z4 coupe alive. The upper beltline no longer seamlessly flows to the boot, with a break at the door handle that curves into the rear, while the lower beltline that runs from the headlamp to the undertray and through to the outer edge of the door ensures you don’t mistake it for anything but a Z4. Another interesting facet are the two crease lines that run across the bonnet to the imaginary centre on the bumper piece where the BMW logo now rests – subtle yet powerful. A wider kidney grille with well defined slats and a lower bonnet line highlight the width of the car, despite the car being just 6 mm wider than before. What it doesn’t hide in profile is its increased length of nearly 14 cm, sitting on a near identical wheelbase to the outgoing car. This has been done to incorporate the aluminium roof that BMW claims only adds an additional 30 kg to the overall weight. Yet at 1,600 kg, you wouldn’t call the Z4 the equivalent of what the LCA is to the Sukhoi Su-30. Especially since its competition, like the Mercedes-Benz SLK, is lighter by almost 100 kg. So is bigger (and heavier) actually better? Well, it is extremely well equipped for a roadster. You get the new generation iDrive with a high resolution screen and what have you to keep you entertained. The climate control knobs across the centre console are well thought out and have a very good feel to them. The seats are extremely well designed and have very good side bolstering, though they can be a bit of a bother for big-built drivers. Space on the inside is at a premium if you are anywhere on the north side of 5’10” – you could end up with a nasty swollen head. But your chest swells with pride when you read what’s under the hood. It is without a doubt among the two best six-cylinder petrol engines in the world (the other is in the Nissan GT-R!). Like the GT-R, it has two turbos, but unlike the GT-R these are small capacity ones, each linked to three cylinders in the bank. 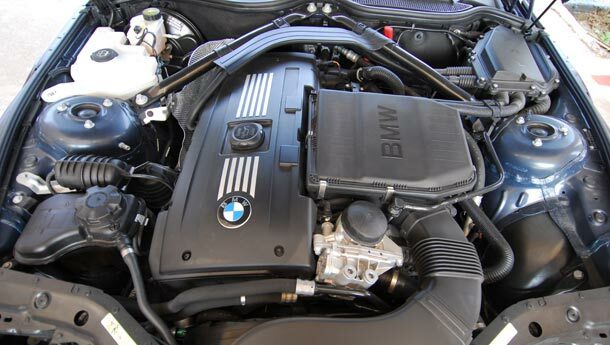 Measuring in at 2979cc, the engine block is actually based on an older motor and is different from the one found in the 530i, by account of using an aluminium block and cast iron cylinder liners, unlike the 2996cc engine that uses aluminium and magnesium, as found in the 5er. This has been done to allow the engine to withstand the stresses created by the two turbos, thus making it heavier at nearly 195 kg versus the newer block’s 160-odd kg. So now, you find a reason why the overall weight of the car is on the porkier side, but I haven’t even gotten to the juicy part just yet. Delivering a staggering 306 bhp@5800 rpm, the SDrive 35i delivers a shade less power than the 4.0-litre V8 found on the 740Li, and is identical to the 306 horses developed by the 3.4-litre Boxster S. But, unlike the Boxster S that provides 36.7 kgm of twisting force at 4750 rpm, the Bimmer produces a gobsmacking 40.7 kgm of torque from as low as 1300 rpm, going all the way up to 5000 rpm. While the engine also boasts of high pressure injectors, the turbos are set at just 0.4 bar. 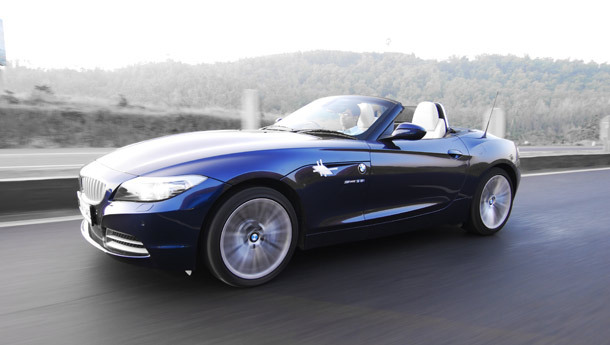 Despite all that, the Z4 is tremendously quick – quick enough to not warrant a Z4 M in the lineup. The 0-200 kph time, for instance is genuinely sub-20 seconds – not as quick as the bigger cubed R8, but enough to make most other roadsters lick their wounds. Passing speeds are just a daze and if you must ask how quick, it’s quicker in the 80-120 kph run than the R8! What matters though is how easily it shifts between low speed pootling and a full, fat wail. We tried hard to look for a flat spot between revs, a weak link where we could scream ‘turbo lag’. But there was none. Each turbo kicks in so unobtrusively that it feels like sitting on a rocket chair with all its controls yanked off! Add to that, this engine has a very strong split personality. From sounding like what distinctly feels like a V8, it screams from 4500 rpm to 7000 rpm just like any turbine equipped six-cylinder should. No wonder then, for the last three years the journalists who vote for the best engine in the 2.5- to 3.0-litre category have just not bothered to update the winner’s column – it’s that good! Even under braking, the car feels extremely tight and goes about its business just like any good coupe. Since we tested with the roof in place, it didn’t waver nor squirm, nor did the front brakes bite harder because of all that weight at the front. It’s only if you do a day long ride up to your favourite hill station and back that the brakes start to fade by the time the sun starts to set. Which is all right, considering you don’t put too much stress on the brakes climbing up. And when you do come down, it’s best to use the dual clutch gearbox like this was your last drive. Combined with the superlative engine, the gearbox works just as intuitively as the engine does when you put your right foot down. Shift into Drive Sport and just attack the corners using the paddles. In the plains, the pull-up/thumb-down pattern tires you out and it feels like you are fiddling rather than actuating gears. But use that combination in the hills and it works like a charm. Since the ratios are so well spaced out, the 7-speed auto responds faster than you can blink. Downshift once, twice, even thrice and the gearbox quickly settles into the gear you want to be in. If you do that in Drive Sport, it will marginally squirm and hold the line, but do that in Drive and the ESP will cut in at around 5000 revs and the rump will just wiggle a bit. So the trick is to shift the gear into the left column and just keep it there. Because you have the upshift and downshift patterns on either side, it allows you to downshift easily even mid-corner without having to hunt for the left paddle behind the steering under normal circumstances. That brings us to its handling. It’s every bit a BMW, and more coupe-like in its handling than one would expect. The steering is nicely weighted, though a bit artificial in the way it steers – somewhere BMW’s servotronic EPS does show its ‘electric’ feel after all. It’s something which is true for BMW convertibles in general (even the 650i), which don’t steer with as much feel as their hardtop counterparts. Yet, body control is next to faultless. 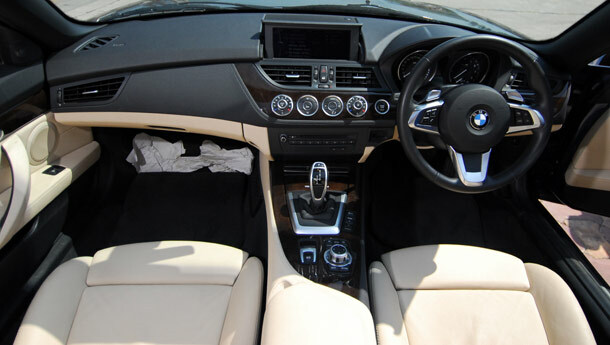 Like every other BMW, the car just envelopes itself around the driver, and given the Z4’s long nose and the fact that you nearly sit over the rear axle, you never actually feel intimidated. While we wouldn’t know how the car felt in Sport or Sport + modes, it still felt nice and taut, with the weight balance shifting flawlessly and you could kick the tail out, get the car sideways before the ESP cut in rather harshly. Switch it off and you really start to explore the scenery differently, but it is rather easy to overcook it without the protective net. Despite all that, the overall chassis balance is rather pointy and rewards enthusiastic driving, with a lot of leeway. Non-usage of sport functions also left us with little to gauge about how it would feel when the dampers were tightened. Nevertheless, it rides reasonably well in Normal mode, though it borders on the harsher side. Which is okay, considering the way the car handles and those 19-inch tyres that are easier to kerb than making instant noodles. 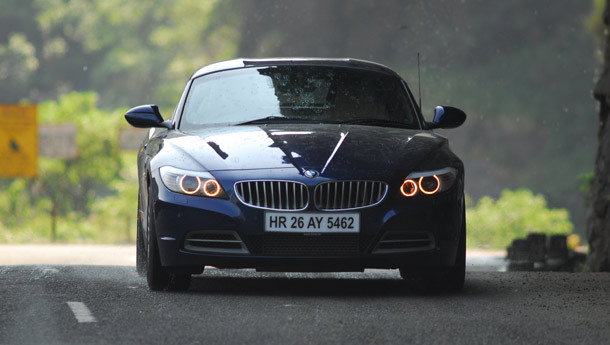 Of course, you have to be gentle with the way you tackle road obtrusions, since the Z4 rides very low for Indian conditions. That robs the car of some of the practicality it enjoys. But only some. Come to think of it, in real world conditions, this car is quick. And very easy to drive. And the folding aluminium roof does its job in the same time as the car hits 200 kph – about 20 seconds, and the joy of switching between being a coupe, convertible and a hell raising performance two-door is just unspeakable in these pages. For what the Z4 is, it is fantastic value, unless you need the additional seats which only the Audi TT can provide for now, but the TT just doesn’t go as fast nor has a sense of drama about it. Nor does the SLK, despite being a pioneer of folding metal roofs. The Boxster is great if you want a Porsche and a driver’s car, but the platter of achievements the Z4 is capable of is rather remarkable. Okay, it could have ridden a bit better and probably not have been so expensive, but really, don’t you want to be a part of a privileged few? It probably isn’t the world’s best roadster, but as something that tries to satisfy a bit of everything it seems to occupy prime position. Though, once you prime that Sport button, the experience will be even more hair raising!